Since 1960 we have recruited, trained and placed over 2000 volunteers in 48 different countries. Today we have volunteers in Africa, Asia, Latin America and the Caribbean. Over the past year, VC volunteers have had a positive impact on the lives of almost thirty seven thousand people in fourteen countries throughout Africa, Asia, and the Americas. VC Volunteers help build the ‘social infrastructure’ – individual skills and institutional capacity – critical to all countries. The partner with whom our volunteers are placed with range from grassroots community groups to larger diocesan and NGO organisations. 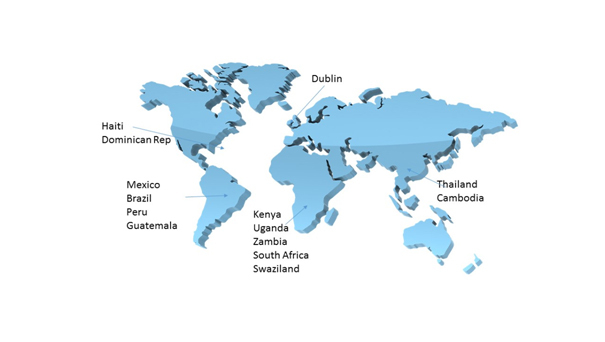 VC’s International Head Office is located in central Dublin, Ireland and this office serves its four regional areas of involvement; Southern and East Africa, SE Asia, Caribbean, and Latin America. VC’s Venture development training programme is also run from this office, as is the development and volunteer recruitment and support functions. The office is located in close proximity to one of its main funders, Misean Cara, an agency set up to provide grant support to Irish Missionaries overseas.